Yes, we know this is an unpleasant sight. But this whole war was very unpleasant - especially for the men who had to fight it. So don't complain if we confront you with their reality. This is a French medical picture, made on March 31, 1918. 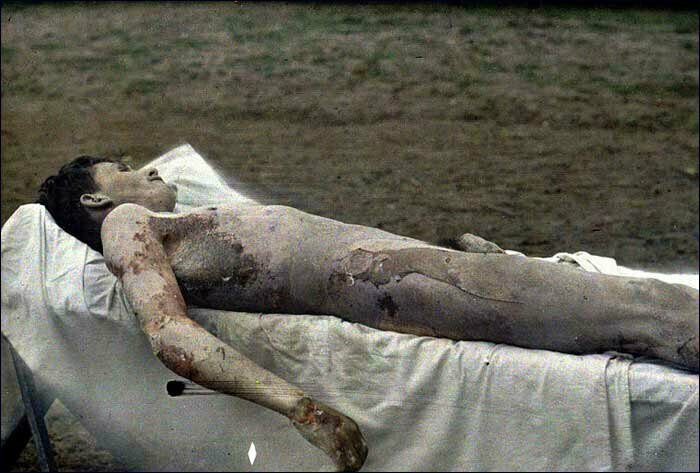 The dead man is a French soldier of the 99th Infantry Regt., who was killed by German mustard gas. The gas not only burned his lungs and intoxicated him, but also tore his skin apart. The photograph is an autochrome color picture. This photocolor process was invented in the beginning of the 20th century by the Lumière brothers. We have 250 color pictures from the Great War: many of these original autochromes and others artificially tinted. The War Picture of the Week is an extraordinary photograph, painting or drawing, showing unusual detail or an different view. We have an ARCHIVE with recent choices. The Heritage of the Great War has articles mainly in English; some are in Dutch (Flemish) only. We also show the literary war (poetry & prose), political cartoons and many photo slideshows. De Erfenis van de Groote Oorlog heeft vooral artikelen in het Engels; sommige zijn alleen in het Nederlands. We tonen ook de literaire oorlog (poëzie & proza), politieke prenten en veel foto-albums. 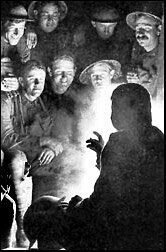 This website is dedicated to the events and consequences of World War One. We put some emphasis on unorthodox and thought-provoking points of view. We are averse to historicism and military fetishism. And we show people rather than strategic plans or statistics. 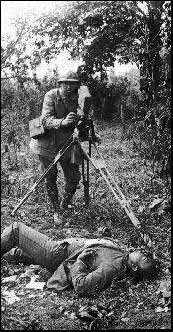 To this end this website features one of the most extensive and explicit WW-1 photo collections on the Internet. We have special sections for English and Dutch speaking students, where they will find help with their papers or essays on the Great War 1914-1918. 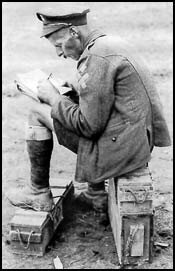 Questions, Opinions or Ideas about the Great War ? Join the English-language Great War Forum — recommended! Vragen, meningen of ideeën over de Groote Oorlog ? Ga naar het Nederlandstalige Forum Eerste Wereldoorlog — aanbevolen! While you surf this website you can listen to some music from the Great War. Make your choice from the midi-files in our Music Box in the table of contents on the left. We also have an article with more Music from the Great War to download, including 1914-1918 originals (MP3's, WAV's, Real Audio etc). Happy listening!